The Seaport Hotel & World Trade Center is one of Boston’s top meeting and event venues. 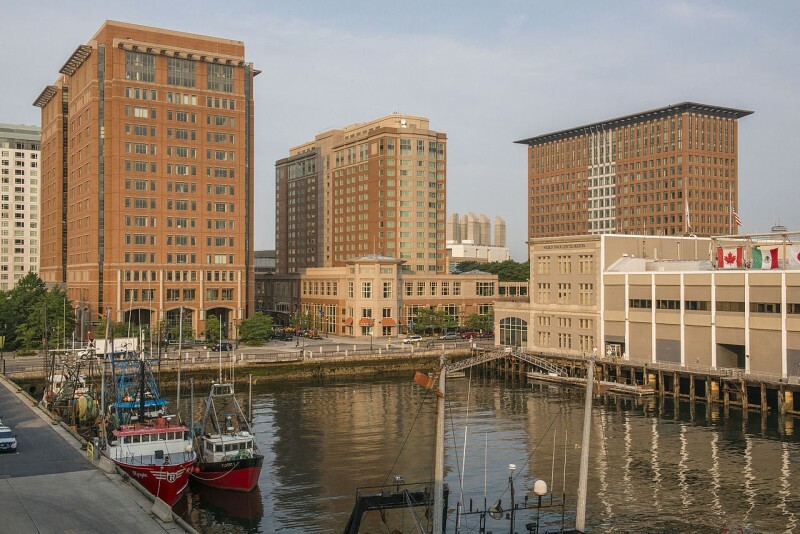 Located in the thriving Seaport District, Seaport offers gorgeous views of the Boston Harbor and is conveniently located near Boston’s main attractions. Actually two separate buildings that are connected to create more than 180,000 square feet of special event space, Seaport Hotel and World Trade Center offers more event space than any other hotel in Boston. Because it provides so many different possibilities for events in a gorgeous setting, Seaport is one of our favorite Boston event venues. Seaport Boston offers 42 unique event spaces, meaning no matter the scope, length, complexity, or size of your event, there’s a venue to accommodate it. Its world-class meeting and private event spaces include: seven ballrooms, an amphitheater, a convention center, boardrooms, breakout rooms, several beautiful outdoor spaces, private dining rooms, and exhibition spaces. Amphitheater (400 seated guests) – With a 576 square foot stage, state-of-the-art audiovisual equipment, and teleconferencing and broadcast video capabilities, this indoor amphitheater is perfect for meetings, speakers, and presentations. There are also several nearby breakout rooms for smaller, intimate sessions. Commonwealth Hall (2,200 seated guests; 3,500 standing) – Perfect for large-scale corporate programs that include exhibits, trade shows, or conventions, Boston’s largest convention hall offers 118,00 square feet of high-tech event space. Lighthouse Ballroom (Lighthouse 1: 300 seated guests; 350 standing; 220 theater style; Lighthouse 2: 96 seated guests; 100 standing; 80 theater style) – With two levels that offer 25 foot ceilings, floor-to-ceiling-windows, a projection screen and an “LED feature wall,” this gorgeous contemporary space is ideal for formal dinners or corporate receptions. The plaza and mezzanine levels can be booked together or separately. The Headhouse Concourse (5,000+ standing guests) – One of the most popular outdoor event spaces in Boston, this historic concourse is a grand space, offering gorgeous views of the Boston Harbor, downtown Boston, and the Seaport District. If you’re looking for a unique space for a cocktail hour, large-scale reception, gala, or dinner, the Headhouse Concourse just might be the right fit. Aura Restaurant (200 seated guests; 150 standing) – Seaport Hotel’s well-known restaurant, Aura is the perfect private event space for seated dinners and corporate receptions for up to 200. The entire restaurant can be booked, or you can choose from two private dining rooms – Magnum A and Magnum B – for more intimate dinners for 10 to 60 guests. An award-winning event management company, On The Scene has experience producing a wide variety of corporate events and meetings in Boston. Our event professionals become an extension of your team, working with you every step of the way, from initial coordination to production, to help you choose the right event space for your Boston corporate event. If you’re considering Seaport Boston as the venue for your next corporate program, contact On The Scene today!